From its birth in 1925 to the early days of the Cold War, The New Yorker slowly but surely took hold as America’s most prestigious, entertaining and informative general-interest periodical. In Cast of Characters, Thomas Vinciguerra paints a portrait of the magazine’s cadre of charming, driven, troubled brilliant writers and editors. 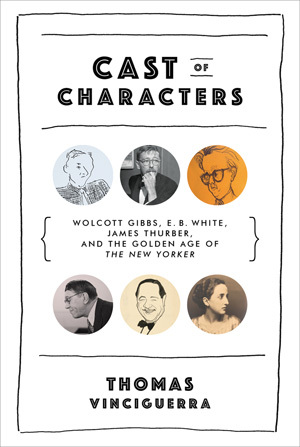 Many of these characters became legends in their own right but Vinciguerra also shows how, as a group, The New Yorker’s inner circle brought forth a profound transformation in how life was perceived, interpreted, written about and published in America. Cast of Characters is the most revealing and entertaining book yet about the personalities who built what Ross called not a magazine but a “movement”.